Let me start with my final paragraph. Wonderful stuff. 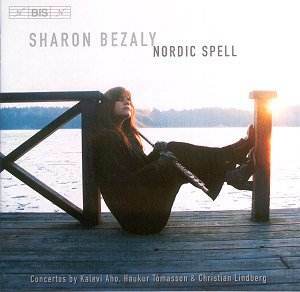 Bis has been on a winner with Sharon Bezaly for some time now but this is surely the most splendid so far in the series, playing three works inspired by and dedicated to her. Nordic is certainly geographically accurate and the Spell will soon weave its magic as you listen to these three very different works, all recorded with three different orchestras under three different conductors (of whom one is Lindberg). Aho�s Concerto is the longest - a three-movement work of frequently ravishing beauty. Though the first movement has its fair share of grit � mainly percussive - the prevailing sense is one of lyrical floating. The glittering lightness and agility of the writing and playing is at its most intense in the fast second movement, a presto that is certainly quick but, miraculously doesn�t sound too fast, so acutely accomplished is the articulation at speed. The orchestration is light but opens out into a wash of colour, led by brass and more percussive drama. Ominous, adrenalin pumping moments are here, and they lead into a five minute Epilogue that reverts to the feeling of the first movement and ends with lines of rapt simplicity and contemplation. In a sense this represents a compositional arc and how Aho achieves the sense of return with such perfectly judged naturalness is one of the work�s little miracles. Tómasson�s 2001 Concerto for flute, his second, is written in five movements, each of them characterised with exceptional skill and attractiveness. Their compactness � none is longer than about five minutes � in no way diminishes their cohesion or the formal structure of the work. It too has its share of more tensile material with a flighty flute above a percussion-strong rhythmically dramatic orchestral palette in the second movement Scorrevole. Whilst there are hints of Schoenberg in the central panel, the Calmo heart of it has such fascinating colouristic hints that one listens enraptured. Christian Lindberg�s concerto for flute and chamber orchestra is titled The World of Montuagretta. It derives from a documentary about Brazilian "travesti" that made a profound impression on the composer and embodies qualities of innocence and optimism. Lindberg conjures up butterfly acrobatics for his soloist and colours his writing with iridescence allied to intoxicating rhythm. The third movement flirts with Spanish tinges, shades of the Concierto de Aranjuez maybe, but there�s carnival spirit in the finale with a real big-band drive to it. Even here though there is room for more introspective moments, tense reflection, before a warmly optimistic ending. Lindberg manages to imbue his music with great warmth, a certain panache, and lashings of colour. Bezaly plays the works she has inspired, whether on flute or alto flute, with immense authority and sensitivity and Bis�s recording set-up captures balances perfectly, in much the same way as their notes set the scenes so well. I�ll end as I began � wonderful stuff.